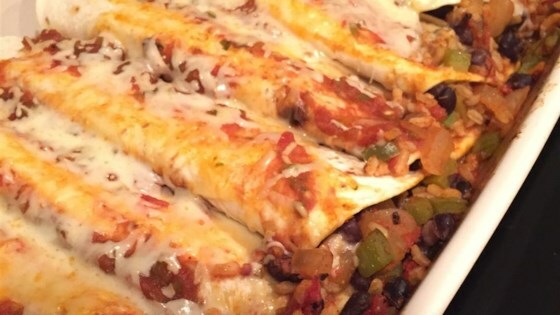 "These vegetarian black bean and rice enchiladas are just as satisfying as those served in restaurants." Watch how to make this easy, healthy dish. These were enjoyable and healthy. But, I have a seafood and spinach enchilada recipe that I frequently prepare which is much tastier. Increased cheese to two cups and just used my favorite enchilada sauce instead. Great for meatless Monday. These were awesome!!! My whole family loved them and asked for more. The only change I made was instead of brown rice I used quinoa. Delicious! Tasty and easy Meatless Monday meal. I used quinoa instead of the rice the second time I made it for even more nutrition. Delicious. Didn't change anything other than used white rice (that's what I had). We are not vegetarians but I made this for a guest and we all enjoyed it. Will make again.